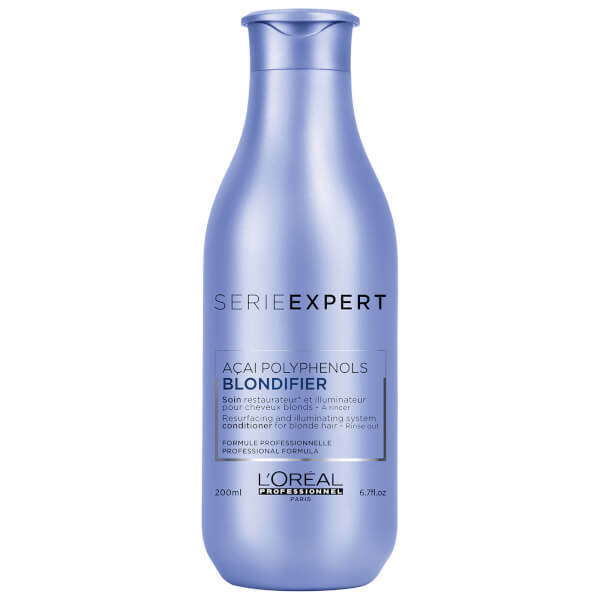 Create soft, shiny locks with L'Oréal Professionnel Blondifier Conditioner, a nourishing treatment for blonde hair. Working to resurface each strand from root to tip, the formula uses Acai Berry Extract with Polyphenols to restore brightness and vibrancy whilst gently detangling for a smooth, sleek finish. After shampooing with Blondifier Shampoo, apply evenly on towel-dried hair. Comb through. Rinse thoroughly. In case of contact with eyes, rinse them immediately. Aqua / Water, Cetearyl Alcohol, Behentrimonium Chloride, Cetyl, Esters, Cocos Nucifera Oil / Coconut Oil, Isopropyl Alcohol, Benzoic Acid, Pentaerythrityl, Tetra-Di-T-Butyl Hydroxyhydrocinnamate, Benzyl Salicylate, Benzyl Alcohol, Linalool, Limonene, Sodium Hydroxide, Hydroxycitronellal, Citronellol, 2-Oleamido-1,3- Octadecanediol, Tocopherol, Alpha-Isomethyl Ionone, Euterpe Oleracea Fruit, Extract, Maltodextrin, Parfum / Fragrance. C220483/1.